This is an amazingly important concept. Yet it's almost universally overlooked. Sometimes it’s hard to appreciate the magical role energy plays in our daily lives because most of what we experience is a derivative of it. The connection is hidden from direct view. Because of this, most people utterly fail to detect or appreciate the priceless and irreplaceable role of high net-energy fuel sources (such as oil and gas) to our modern lifestyle. With high net-energy, society enjoys increasing complexity and technological advances. It's what enables us to pursue massive goals like desalinating billions of gallons of seawater, or going to Mars. But without high net-energy fuel sources, our capabilities quickly regress to those of decades -- or even centuries -- past. Which is why understanding where we truly are in the 'net-energy story' is so incredibly important. Is the US on the cusp of being "energy independent" from here on out? Is the "shale miracle" ushering in a glorious new 'boom' era that will vault America to unprecedented prosperity? No. The central point of this report is that the US is deluding itself when it comes to energy abundance (generally) and oil (specifically). Yet that's not what we hear from the cheerleaders in the industry or in our media. From them, we hear a silver-tongued narrative of coming riches -- a narrative that contains some truth, some myth, and a lot of fantasy. It’s those last two parts -- the myths and fantasies -- that are going to seriously hurt many investors, as well cause a lot of extremely poor policy and investment decisions. The bottom line is this: The US shale industry resembles a fraudulent Ponzi scheme much more so than it does any kind of "miracle". How do I know that? 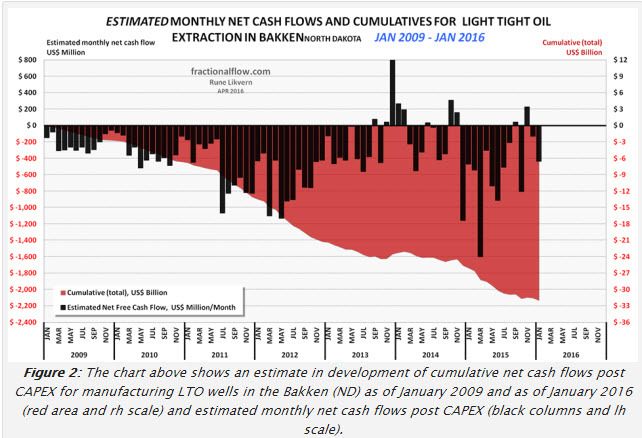 Because, collectively, US shale companies have lost cash in every year of their existence. The burned through cash when oil was $100 -- and again when it was $90, $80, $70, $60, $50, $40, and $30 a barrel. They burned through cash in 2008, 2009, 2010, 2011, 2012, 2013, 2014, 2015 and 2016. You don’t have to be a finance guru to appreciate or understand that any industry that persistently burns through cash is a bad deal. Especially one whose prime product – shale wells – principally deplete (-85%) in roughly three years. If you’ve been in business for 9 years drilling wells that mostly run out in 3 years, and you haven’t managed to produce positive cash flow at any point along the way, then it's time to admit that your business model simply doesn’t work. The [US shale] industry has also lifted productivity. Drilling is faster, more selective and more accurate, and leakage rates are lower. Wells are being designed to penetrate multiple layers of oil that are stacked on top of each other. But the fact that the industry makes huge accounting losses has not changed. It has burned up cash whether the oil price was at $100, as in 2014, or at about $50, as it was during the past three months. The biggest 60 firms in aggregate have used up $9bn per quarter on average for the past five years. As a result the industry has barely improved its finances despite raising $70bn of equity since 2014. Much of the new money got swallowed up by losses, so total debt remains high, at just over $200bn. Let’s run that math. Five years is 20 quarters. That times $9 billion/quarter is $180 billion dollars in cumulative operating losses. This begins to give us a sense of the magnitude of losses investors will face when the music finally stops. Or we could note the $200 billion of total debt outstanding for the industry. Hmmmm…with WTIC oil at $47/barrel, a typical wellhead price (that the operators actually receive being less than WTIC, always) might be closer to $40. $200 billion divided by $40 means that 5 billion barrels of future wellhead production is required just to pay back the debt! If the industry decided to use the next 5 billion barrels coming out of the ground to debt reduction (it never would decide this, but bear with me for the sake of this intellectual exercise), we'd also need to include the time value of money (and actual production rates over time) and observe that the debt carries an interest rate of 5% to 8% (depending on the company). Taking that into consideration, then the next 6 billion barrels would be required to satisfy the debt, plus interest payments! Oh, right. And then there's the issue of repaying the $70 billion of equity raised since 2014. With some sort of return, if possible, of course. I hope you see the same staggering disconnect in these numbers I do. Which is why, without have to go too far out on a limb, I’ll state that massive losses are coming to the (bag)holders of all this debt and equity. So why care? Because you need to understand these details in order to position yourself properly for the future. The implications are enormous. Once you become aware of the magical thinking involved, you then have a chance of knowing why the future is going to be very difficult for the shale industry, its investors, and then the nation(s) depending on its oil production. Hey, sometimes myths and fantasies are harmless to hold. Like dreaming that someday you’ll be a major rock star. But some can be incredibly damaging because they lead to poor life choices and decision-making. Like emptying your bank account to bet on the Powerball lottery, where your chances of winning are 292,201,338 to one. Or committing your nation to a ground war in Asia thinking you can "win". What does “energy independence” mean? It turns out, this crowd-pleasing phrase is a fantasy that lacks any useful grounding in reality. What those who claim "energy independence" are doing are lumping all forms and sources of energy into a single bucket, and then asking if the size of that bucket matches our current demand. This is an inappropriate and dangerously misguided way to look at things is because the various types and sources of energy are not interchangeable. They don't function the same way. They generally can't be substituted for each other. And they don't cost the same. For example, your automobile might run on gasoline which costs $2.50 a gallon. Suppose instead you could buy coal cheaper than gasoline on a BTU basis; is that any help to you as an auto driver? Would you suddenly put crushed coal into your gas tank instead of gasoline? No, of course not. Not if you drive a car that requires gasoline. Or cook on a gas-powered stove. Or heat your house with an oil-burning furnace. The same is true for the US (or any country). A country is not "energy independent" unless it can meet all of its national energy demands with enough BTUs in each of the needed fuel types. Just looking at oil alone, the US still imports millions of barrels per day -- even with the "shale miracle". I'll get into this more deeply in just a moment. So, when the US lumps all of its various sources of energy into one spot – including hydropower, wind, solar, coal, oil and natural gas – nothing useful emerges from that method. We cannot know from it if we will have too much or too little of any one type of energy, or how much we’d be under or over budget in selling the surplus of one and buying to cover the deficit of another. The delusion has only gotten worse under Trump. The useless and misleading clumping of energy into a single bucket has morphed into an even larger error; one shared by many otherwise intelligent "experts". It is a massive error to state that the US “is on the brink of becoming a net exporter of oil.” While I can see how that conclusion follows logically from all the disinformation provided about “energy independence” and the hype spouted by Wall Street and the shale companies -- it’s totally false. The US is NOT on the brink of becoming a net oil exporter. And it almost certainly never will be. But it would actually be harder than that. As already mentioned, shale wells have ferocious decline rates; so an additional 5 million barrels per day would require adding to new production aggressively each year to offset this ongoing extreme loss of production. Well, before another shale 'miracle' comes roaring out of the gate we’d need two things: enough new places to drill and more massive injections of capital. Both are suspect at this point. "Our break-even oil price is $20 a barrel," Frank Hopkins, Pioneer’s senior vice-president, told an industry conference in London this week. "Even in a $40 world, in a $50 world, we are making good returns. A company breaking even at $20 should be rolling in cash with oil at $45. But they aren’t. 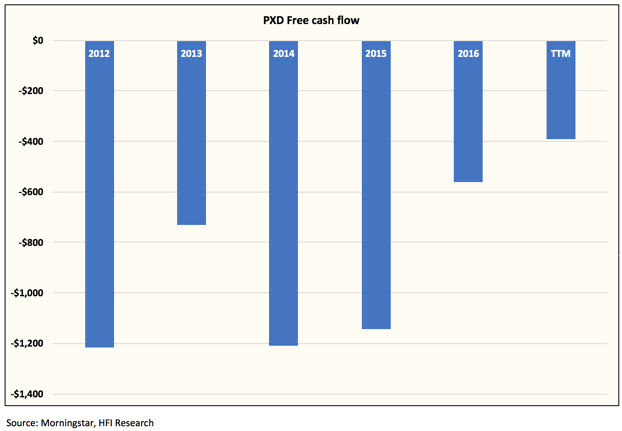 Here’s the cash flow chart from PXD. Ouch. What explains the huge gap between the company’s own statements and its actual performance? How can the entire industry be doing so poorly? Dr. Anas Alhaji, an economist and oil industry consultant based in Texas, along with Al Rajhi Capital, compiled the breakeven points for the largest shale producers between 2014 and the start of 2017. When placed alongside a graph of the spot price of WTI oil from the end of three quarters prior, it appears the breakeven points for shale are actually a function of the past price of oil itself. This indicates that because shale costs are not fixed or even stable, the industry will likely struggle to achieve consistent profit unless the labor market and vendor markets are transformed. Essentially, shale should struggle to achieve sustained profitability, no matter the price of oil. 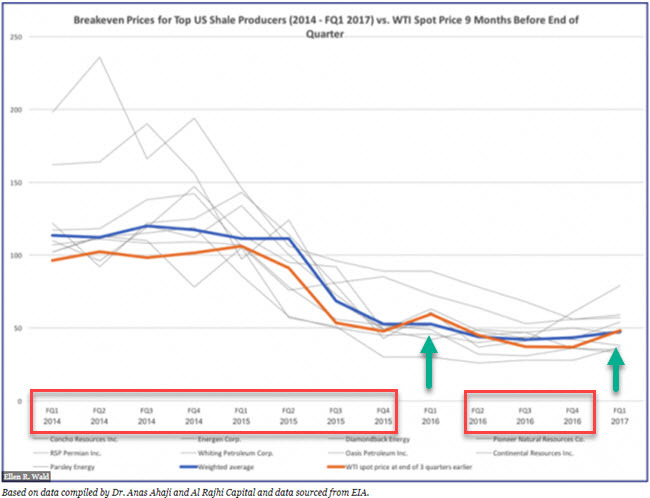 First, the blue line is the weighted average breakeven cost to produce oil from shale wells. Second the orange line is the WTI price of oil -- it's usually below the blue line. Keep in mind: the WTI price is always higher than the price the operators actually receive at the well head for their produced oil because of shipping and other costs. So mystery solved. Costs higher than revenues = Losses. This chart says “These companies do not make money doing what they do.” The companies' own financial filings say the same thing. There’s no real mystery here. These companies are losing money and they have been for years. So, when will this really start to matter? And how will it likely play out? What can investors do to position themselves to hedge against or profit from the inevitable losses that will be realized in this industry? Given the size and the importance of this sector and its product (oil), the repercussions will be felt far beyond the share companies themselves, up to and including sovereign assets. In Part 2: The Coming Shale Debacle we detail out our projections and strategy for investors to consider in their portfolio positioning. The investment world rarely provides opportunities with as predictable a result as the correction coming to the shale industry. Please note that some of your charts do not label the units of the quantities on the vertical axis, leaving their meaning a little obscure. Aloha! Debt always drives every thing. To me this is the same SubPrime ponzi and mostly it is the "debt factor" that has made it so. If a company is in debt then they go with "drill baby drill" ... what other choice is there once you have swallowed the banker bait! Again new technology is in the equation. What were the government and bankers supposed to do discourage the use of the Baker Hughes tech marvel? Nobody knows "short term" better than bankers and politicians. When people are employed they vote for you and don't riot. During the 2009 collapse the oil patch was booming in places like the Haynesville Shale. Millionaires were made and people had decent jobs, not part time Home Depot and WalMart greeter jobs. Human nature dictates that we drill ... not for independence but for jobs. Every cycle has its ups and downs. This cycle is running out faster thanks to severe depletion rates. So while depletion rates kick in Obama makes a deal with the Rep Congress to suspend the debt ceiling and stack another $9TRIL onto the backs of your kids and their kids! Morals are more depleted in Washington DC than frakers well heads! Who benefits from this distortion of wealth? Mainly the government. They tax the casings and mud, they tax the drillers, they tax the workers, they tax the local stores. Then they get re-elected! Like the $15/hr wage. Pay people more and the government gets more in payroll tax so those in power can stay in power. It has nothing to do with charity or kindness towards people! Nobody ever lobbies Washington DC for altruistic reasons! There is no such thing as altruism in government! The only thing worse than FRAKPRIME is GOVPRIME! Energy equivalence shouldn't be dismissed as lightly as you do. If I had a hydro plant in my yard (or installed a bunch of solar generation on my house) I'd be inclined to replace my vehicle with an all electric one, shift from gas heat to a heat pump, etc. If I had a supply of cheap coal I might get a pot-belly stove to heat my house. All of these things come with a conversion cost so to be seriously considered you would need some confidence that your current low cost energy source would continue to be available, and low cost, well into the future. You would also need a reasonably accurate understanding of the energy situation so that you could make sound comparisons. The biggest problem with treating energy as one amorphous blob is that it obscures the real tradeoffs between the various energy sources. The average person listening to the bloviating politicians comes away thinking that we have solved the oil problem and that gasoline will be cheap long into the future. The fact that shale oil makes a loss shows us that it produces negative Net energy. i.e. It takes more than one barrel of oil equivalent to extract each barrel of shale oil. How and why is this possible? How: The shale oil energy production is being funded and subsidized by the positive Net energy from conventional oil, gas, coal and existing nuclear and renewable production. The financial system enables profits from these other forms of energy production, via the economy and slight of hand, to fund the losses of shale oil production. Why: Oil is the master fossil fuel. It is worth extracting it at an energy loss because we have no substitute for it, as transport fuel. The economy needs oil and we will fund its production, even at a loss if need be. I wouldn't hold your breath waiting for the shale oil industry to collapse. It will be propped up at virtually any price. The premise of this article (and the conclusory statements based thereon) are wrong. Endless growth as "increasing complexity" allowing megaprojects such as "desalinating billions of gallons of seawater or going to Mars" is posited as the necessary goal and then lamented that oil based energy cannot continue to provide endless growth. The beginning of this article states that "With high net-energy, society enjoys increasing complexity and technological advances. It's what enables us to pursue massive goals like desalinating billions of gallons of seawater, or going to Mars." We dont NEED your "increasing complexity" and so-called "technological advances." And, most importantly we dont need your collectivist/globalist "massive goals." If you study the so-called "technological advances" by reviewing the patents over the last 20 years it becomes clear that your stated idealized "advances" of increasing complexity are mostly "advances" in repression (monitoring of people and their control via electronics) for the benefit of the elite. In most cases, the new technology only serves to take away some freedom (like the ability to use existing software without having to ask for new type of permission in real time from an organization that is merely benefiting from a new higher complexity racketeering scheme). The Internet of Things is another example. We dont need "increasing complexity" and "massive projects" The globalists and their apologists do and particularly will benefit with the internet of things as this particularly powers their neofeudal ambitions. Increasing complexity in software is only chaining the people to globalist corporations by taking away the software they already paid for (MS word processing, most other software that get "updated" with "advances" that merely block us from using them unless we pay new money for a new product come to mind). We don't need increasing complexity, we need more focus on skills, training and developing small communities that can be resilient against the global elite who are using "increasing complexity" and "massive projects" to ensnare us in their new neo feudalism globalist ambitions. The old system based on fiat currency and its values of increasing complexity and globalist megaprojects is NOT anyone's solution. Instead we need new money and resilient community development. Adulation of the rotten dying system is not helpful. Increasing complexity in pharmaceuticals and anything related to the healthcare system, on the whole, is not improving our health (quite the contrary) as the legal system and the bought-out-government agencies employ increasing complexity and "massive projects" such as progressively racketeering programs on the national scale, to extract more from each person and provide less. This increasing complexity and massive projects termed "progress" is really racketeering and definitely extends to technology. "Increasing technology" seen in almost all new patents do NOT represent significant advances but merely exploit tricks (some chemical, some linguistic and grammatical) to dress up old drugs in new forms, which together with the threat of litigation force higher prices on gullible compliant subjects for old technology passed off as new and improved. This article refers to " vault America to unprecedented prosperity" as a good thing and argues that shale oil is a fraud because it fails to meet the profit/loss desires of the dying paradigm, to provide unprecedented prosperity. But we do not need endless growth. We should NOT be looking to endless energy to solve problems of endless growth. The answer to water shortages is not "desalinating billions of gallons of seawater" and the answer to climate change and pollution is not "going to Mars." Such things are good for globalism and their banker owners, but are not in the interests of locally sustainable communities. Forget the globalism and dream of endless growth please. Another flaw in this article is the assumption that big collectives will save us with their megaprojects and these must be profitable but that the oil patch sector never made any money. But fiat money and the old rules of exponential growth and profit/loss in fiat is coming to an end. Moreover, virtually ALL of America is fraudulent with financial loss masquerading as solid economy. Embodiments of the lauded "increasing complexity" and "massive projects" run by the plutarchs abound in America. The biggest car company in America (Tesla), has sales less than 1% compared to GM's sales but loses tons of money every year despite having a market cap that exceeds GM. Shale oil money dynamics pales with respect to this but since Tesla will save the environment by hiding the source of pollution with increasing complexity as a desirable megaproject we overlook it. The biggest oil consuming entity on the planet (the US military) is the biggest increasingly complex megaproject based within the biggest racketeering organization (the US Federal Govt) which is spectacularly losing money every year. I could go on, but the oil patch is not particularly distinctive compared to the rest of the rotten economy. To continue old values of globalist endless growth is counterproductive. We need to respect values of post-growth, or no-growth economy and to stop worshiping the limitless growth of increasing complexity and modifying billions of gallons of seawater to make way for more population, massive projects such as settlement of Mars to make way for more growth etc. The dream is over, lets move on .Mars will be settled, but not as a result of leadership from overlord globalist bankers into continued economic growth. Well I happen to like some level of societal complexity. Simple (low energy) world = everyone's (mostly) either a farmer or a fighter. Complex world = I get to write software. And I can be a fighter as a hobby. I'd prefer to retain societal complexity if we can. I don't really see myself becoming a farmer, and I don't want to have to be a fighter to make a living. Hello, E.I.A. Could you please hold. . .
davefairtex: I think you oversimplify in response to Mot's take on complexity (a subject not explored in the post by Martenson). Complexity is a response to declining net energy. That decline occurs in good part due to overshoot (population grows beyond capacity of available resources). Earlier civilizations had lots of complexity—including extensive educational, scientific, and bureaucratic systems—without fossil fuels. There is no singular "answer" (or scenario with high odds of coming to pass); complexity as we have today and "everyone's (mostly) either a farmer or a fighter" is way too binary ("either:or"). I think the one scenario that is highly likely to happen over the next century or two regardless of anything else is a significantly lower human population. This topic has been dealt with in previous articles and interviews. Complexity is the natural progression of human society. History is replete with it. Increased complexity requires increased specialization which can only occur if fewer people are required to meet the basic living requirements of society as a whole. If everyone is busy obtaining food no one has the time to be an artist (at least not full time) or any one of the many specializations we have developed over time. Only when a small number of people can supply the food for the group can people dedicate their time to being artists, priests, politicians, etc. When the intricate system which has evolved over time has one of its necessary inputs removed (running out of trees on Easter Island, running out of oil today) the system breaks down. The more complex it is the more completely it is likely to break down. Our system today is the most complex that has ever existed. It's likely to break down more completely than ever before in history. Jared Diamond (and others, though I've only read Diamond's books) have written about this from the historical perspective. Jim Kuntsler and Dimitri Orlov (both of whom I've read and recommend) cover the modern case. I agree that human population will be reduced. It has to. The question is what's the carrying capacity of the planet in sustainable steady state. I've read various estimates but 1 billion seems to be the most common. That's assuming we haven't damaged the earth to an extent that the carrying capacity is driven even further down. How are we to get from 7 billion to 1 billion? Famine, disease and war are the historical methods (and they usually work together). I don't see much chance that we are going to come up with another way this time around. I'm with you that I'd like to keep a complex world. I just don't see how that's going to happen. As cheap energy disappears the things that depend on it (like computers, server farms, delivery of web sales by the big brown trucks of happiness) will become prohibitively expensive for a ever growing chunk of the population. With the customer base shrinking the demand for people to program it all will go down. All that assumes we can manage a controlled shrinkage. History suggests contraction will come in fits and spurts egged on by war. The only rational explanation for the elites behavior in the Middle East and Venezuela is that they understand this and want to be positioned to take control of energy supplies when the charade can't be kept alive any longer. Did Trump actually say that? '"Together, we are going to start a new energy revolution — one that celebrates American production on American soil," Trump said in a statement, adding that the U.S. is on the brink of becoming a net exporter of oil, gas and other energy resources. The interesting thing is that no-where does the statement actually say what the US News articles adds, the part about the US being on the brink of becoming a net exporter of oil. 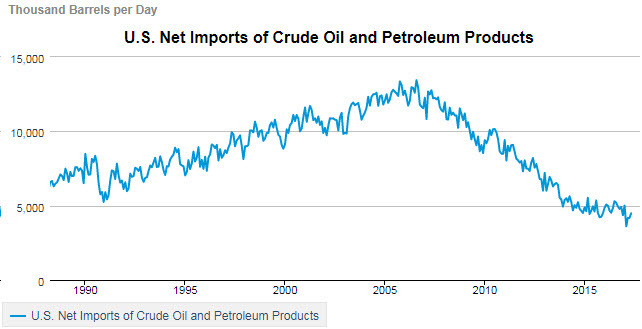 Net exporter of energy, yes, but it doesn't claim to be hailing a future of net exports of oil. The only thing remotely similar the statement says is, "The United States is on track to export an average 1 million barrels of oil a day this year, double the pace of last year." And it may be true or false, but that says nothing of net exports. So maybe US News, not really understanding all the concepts involved, just rounded things a bit and put words in the White House's mouth that they didn't actually say? Or did Trump actually say net exporter of oil, for example during a conference? It's not clear. 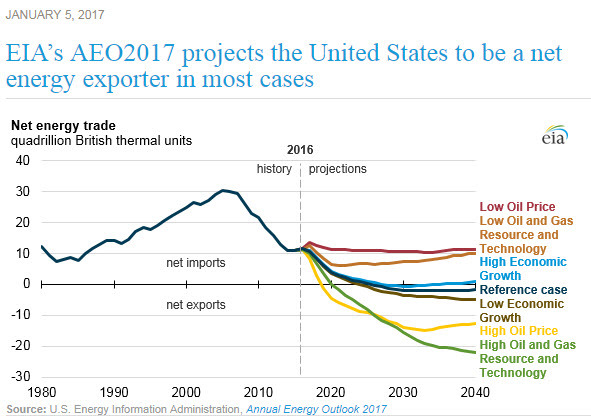 Of course that wouldn't excuse the White House for confusing the public about net exports of total energy all lumped together. Just nit picking on that one thing. Otherwise this Peak Prosperity article is insightful as usual.